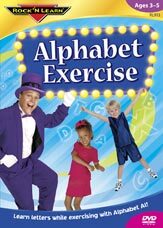 This fun exercise DVD helps young children learn the alphabet while being active and using their imaginations! These exercises are designed for children ages 3 and up who are in good health. If you have any questions about the health of your child, please consult your child’s physician. We encourage adults to do the fitness activities with children. After the Letter N, Al provides a rest break. You may stop the DVD for as long as needed or take additional breaks by pausing the video. Ages 3 – 5. Approx. 37 minutes. I gave Emily, my 3-year-old granddaughter, this DVD from Rock 'N Learn that teaches the ABCs while doing fun exercises to song. She loved moving around, following the exercises with Alphabet Al. It’s just right for young children to get them up and moving during days they can’t go out and play. “This is such a fun video! My 4-year-old loves exercising along with the DVD and he knows all of his letters. I like it because he is active while watching TV and learning. Now, how cool is that?” –Karen T.